Here is the agenda for our upcoming annual Asparagus Information Day on March 4th, 2019. If you wish to be a sponsor for our event please contact us. Here is the agenda for our upcoming annual Asparagus Information Day on March 1st, 2016. Ontario, says markets for Ontario asparagus are growing. Photo by J.P. Antonacci, Norfolk News. Looking for a hot “stalk” tip? Invest in asparagus. Ontario’s earliest vegetable crop will soon be ready for harvest throughout Norfolk County, bringing a welcome boost of local produce to grocery store shelves. “We’re the hotbed for asparagus,” says Bernt Solymár, executive director of Asparagus Farmers of Ontario. Norfolk is home to about 80 growers and more than three-quarters of Ontario’s 2,700 acres of asparagus, making the county Canada’s top producer of the vitamin-rich vegetable. With interest in local food on the rise and homegrown seed varieties opening new markets at home and abroad, this is a good time to be in asparagus. Big changes are happening in the Ontario asparagus industry! Along with the name change the AFO dissolved its districts and has created a new governance structure that will have 7 directors representing the industry in Ontario. Six directors are chosen by the membership and the 7th director is chosen by the new Board, based on need and expertise that may be required. The role of the asparagus industry in the sale of Millennium variety seed had been an on-going topic of discussion in the industry. Millennium is a hybrid developed by Dr. Dave Wolyn of the University of Guelph, which exhibits superior winter hardiness and longevity, resulting in higher yields. These qualities have made it a variety in high demand within the province and in other countries, including the United States. In 2012, Fox Seeds was formed as a separate for-profit organization. The company provides a royalty to the University of Guelph in exchange for rights to grow and sell Millennium seed (and future hybrid releases from Dr. Wolyn’s breeding program). In April 2013, the AFO, and Fox Seeds, hired a new general manager, Bernie Solymár, who comes to the position with 12 years of extension experience with OMAFRA and most recently, 12 years as a private consultant with EarthTramper Consulting Inc. For several years, he provided expertise to the Canadian Horticultural Council’s Apple Working Group in developing their Integrated Fruit Production project. He has also done field research in the testing of novel low-risk pesticides and the development of biological control alternatives. In recent years, Bernie has contracted with several not-for-profit organizations, providing expertise in developing good governance, writing grant proposals and managing various projects. 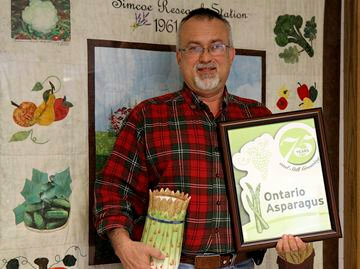 He now brings that knowledge and experience to the Ontario asparagus industry. The traction of point of sale (POS) marketing, the burgeoning “buy local” movement by Ontario consumers, and significant sales penetration into the eastern U.S. promises a continued bright future for the province’s asparagus farmers!